This post is on Brett and Ashley Kavanaugh. Their political analysis, as well as their relationship analysis because of stuff body language experts noticed during Brett's Supreme Court nomination. Mixed, leaning to the left slightly. STRONG right wing indicators here, which is no surprise. Mixed, leaning to the right. Like his wife, STRONG right wing indicators. This makes for a VERY authoritarian personality here, which is no surprise. No surprise, but the economic lean to the right is rare for a Catholic. Interesting notes: Both have Cancer Moon, which in the political analysis above indicates strong cultural conservatism unless neutralized by multiple left wing indicators, but in relationship analysis this shows a similar, if not exact, emotional nature. The Moons are also conjunct, signifying an emotional dependence on one another, which is likely true. Brett for his social status, and Ashley for financial prosperity and a family for her daughters. The difference is that in Ashley's chart, Cancer rules the midheaven, which shows that her public image is that of a "good housewife", and Libra, the sign that detests conflict, on the ascendant further supports that. 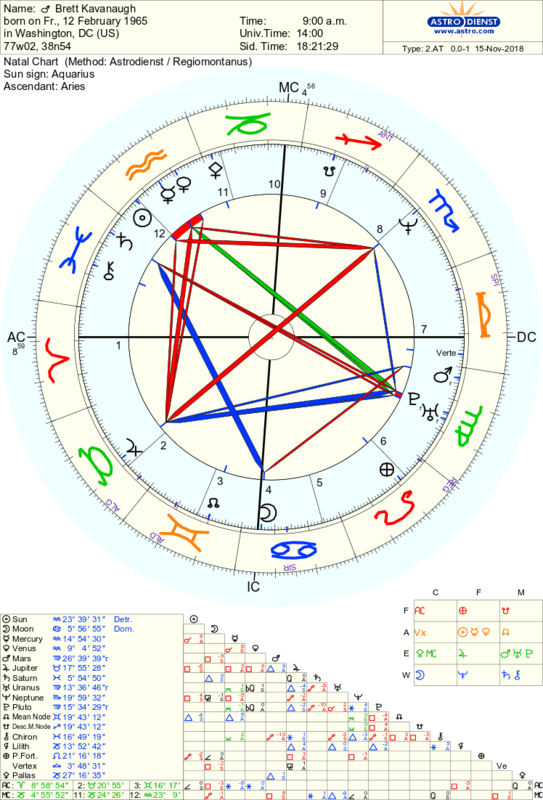 In Brett's chart, it is on the 4th house cusp, with Moon on the cusp, which intensifies the already emotional Cancer Moon. This likely explains his alcoholism, as it's likely to drown out his intense emotions. Remember that he came from a conservative Catholic family, and in society in general, especially in conservative families, it is considered "bad" for men to show emotions. Notice where the name asteroid "Brett" is in both charts. 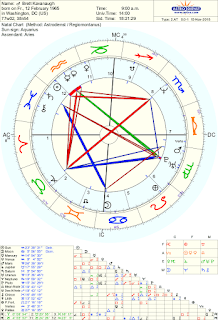 Brett's name asteroid is on Ashley's Jupiter, the planet associated with luck and excess. This makes sense as Brett brings her enormous prosperity, despite her having a political career beforehand in the Bush Administration. However, her "Brett" is on his Mars! This is interesting, as body language experts have noticed the body language of Ashley and her daughters during his nomination, and it wasn't good, and likely hinted that they were scared of him. Mars is the planet of conflict. Another interesting thing is that Ashley's Juno is on Brett's Saturn. Juno is the asteroid that is associated with commitment, and Saturn is the planet of blockage and restriction. She committed to somebody who'll oppress her, and the body language experts also noticed this. In conservative Christian households, divorce is highly frowned upon, and since Brett is the "breadwinner", that ideology and fear of losing prosperity for her daughters is likely why she stays with him. There's more. 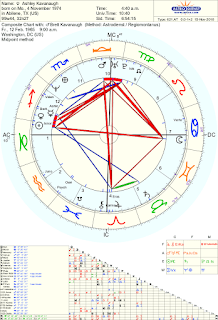 Brett and Ashley's outer planets are in completely different signs, the most notable one being Pluto. Brett's Pluto is in Virgo, along with Uranus, which makes him part of the generation that came of age during the materialistic Pluto in Scorpio/Neptune in Capricorn era, and that generation is also known as "Generation Jones", for this generation is notorious for being obsessed with purity and social norms (Virgo). Ashley's Pluto is in Libra, making her a member of Generation X, a generation obsessed with relationships! The nature of these two generations is COMPLETELY different. Most people marry within their Pluto generation, whether intentionally or not, and it's not uncommon for intergenerational marriage to create issues in relationships. Yikes! Sun, Moon, and Mercury are conjunct, but in the 12th house, which is a malefic house and the house of secrets. Are there hidden secrets? Considering the "history" of most conservative Christian families, likely so. Moon is opposite to the Sun, and both form a tight square to Uranus. This is known as a "T-Square", and it is NOT good, especially since Uranus is a malefic. Uranus is also on the midheaven, which is associated with public image. Uranus is known for being associated with unexpected change, but it is heavily afflicted, which indicates that these changes will likely be bad. Likely Kavanaugh's secrets come out, or he ends up getting indicted by Mueller, or most likely, both? I mean, Kavanaugh's $200,000 debt was mysteriously paid off when he got nominated to the Supreme Court, and it's quite obvious that the vast majority of the GOP are in on the treason! If that ends up happening, their image of the "happy Catholic family" will immediately (Uranus) become a thing of the past. 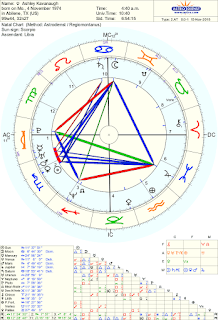 The best aspects in the chart are probably Sun conjunct Amor and "Ashley" conjunct Valentine! 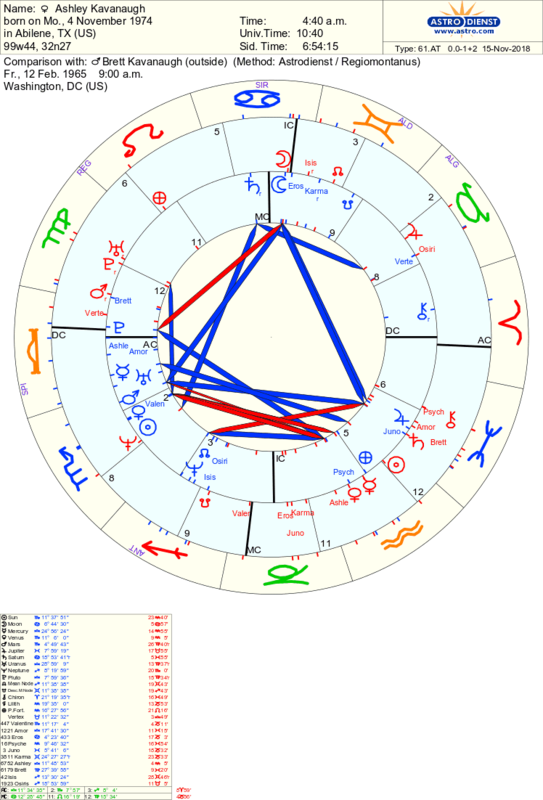 The TWO trines in the chart and the Sun/Venus conjunction are VERY wide, which heavily weakens them, and the only strong sextile is Pluto to Neptune, which has been in effect since the 1940s! Also, Saturn in the 5th house... repressed love? 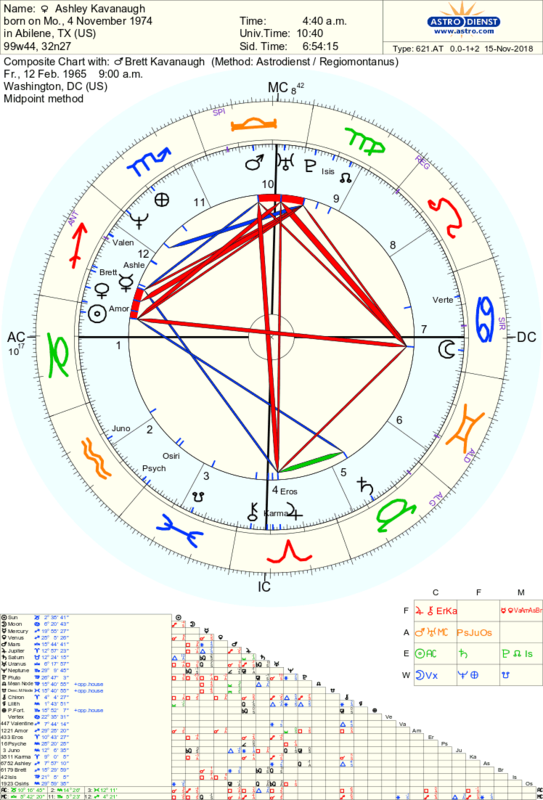 The synastry isn't TOO bad, and in all actuality pretty good, as their angles and Moons are conjunct one another, Brett's Moon trines her Sun, and there are a LOT of trines, but the composite shows what the body language experts picked up on: a strained relationship, and the numerous squares and oppositions and 12th house stellum REALLY show it. All in all, their individual charts clearly show their cultural conservatism, and while their synastry isn't too bad, the composite clearly showed what the body language experts picked up on. Astrology NEVER lies. I'm wondering where you got the times of birth for this couple. I'm especially curious since I see more Moon in Cancer for him, and the Aires rising would suggest that he would be leaner, shorter, and more pugnacious. Does that elevated Moon overwhelm the Aries influence?